Are Shooting Ranges The New Bowling Alleys? 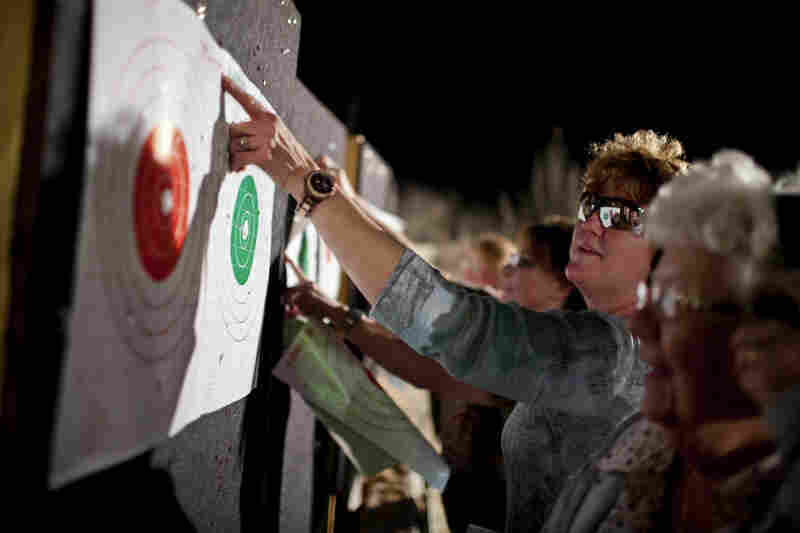 Target practice is only part of the allure as gun ranges add restaurants, lounges and ladies' nights to create a social atmosphere to go along with the firearms training. 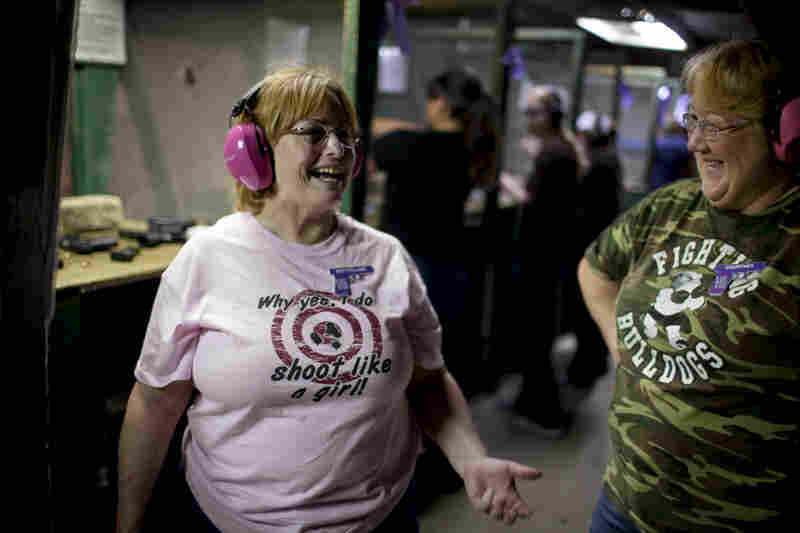 Renee Blaine (left), a member of the women's shooting league A Girl and A Gun, gives Delores Mouton, 75, tips on how to fire a gun during a "girls' night out" event at the Eagle Peak Shooting Range in Leander, Texas. Mouton had never shot a gun before this evening, but hit a bull's-eye her first time. She says she is learning to shoot for personal protection. The all-female league was established by female shooters to educate women about firearm usage and safety, and encourage participation in competitive shooting activities. 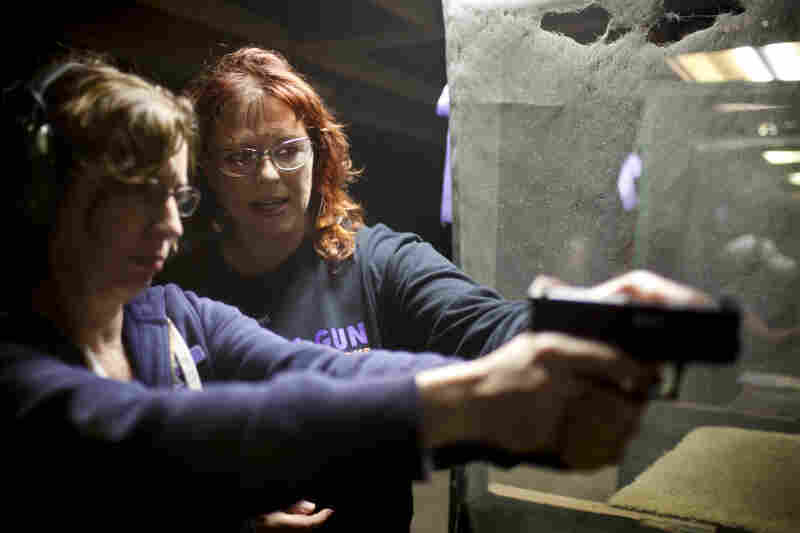 "Several ranges are starting their own leagues, hosting practice nights, and with that comes structure," says Julianna Crowder, a firearms instructor and league member. "Gun owners are not only practicing a skill set, they are improving that skill set with set goals and a purpose." Crowder (right) helps Maria Acosta, a new league member, fire her weapon. Acosta, who has a concealed-weapons permit, joined the league to feel more confident in her shooting in order to protect her home. She says being around the other women makes her feel sure of herself, and not "silly." Bettyelane Kosarek (left) jokes with her friend and shooting partner Courtney Bird. Kosarek started coming to these events last summer because she wanted to learn and to shoot in an environment that wasn't intimidating. Crowder, who calls herself "The Glock Girl," gives pointers on grip to Jennifer Galle. Crowder says parents ask her to teach their kids the difference between real guns and video-game weapons. "I did a private lesson for a 9-year-old boy as his Christmas present," she says. Renee Blaine fires her gun during shooting practice. Crowder says that a majority of the women who come to these events "use this as their 'girl time' away from the daily grind, the house, job, husband and kids." Delores Mouton looks at her target with her daughter Paulette Boudreaux. Mouton says her daughter encouraged her to come to the event. Kosarek checks her target with Crowder. According to Crowder, some women's shooting groups hire certified babysitters, and others have volunteers who take turns watching the kids, "kind of like day care at church." Blaine smiles while giving pointers on technique to Courtney Bird (reflected in glasses). The women in the group go out to dinner after their time at the range to socialize. The Freestate Gun Range in Middle River, Md., has staged competitive, poker-style target games and zombie shoots. The Family Shooting Center in Aurora, Colo., showcases gourmet elk and pheasant bratwursts. The Governors Gun Club under construction in Powder Springs, Ga., will feature a members' lounge and bar. Games! Specials! Online coupons! Sign up for teams! Fun for the whole family! 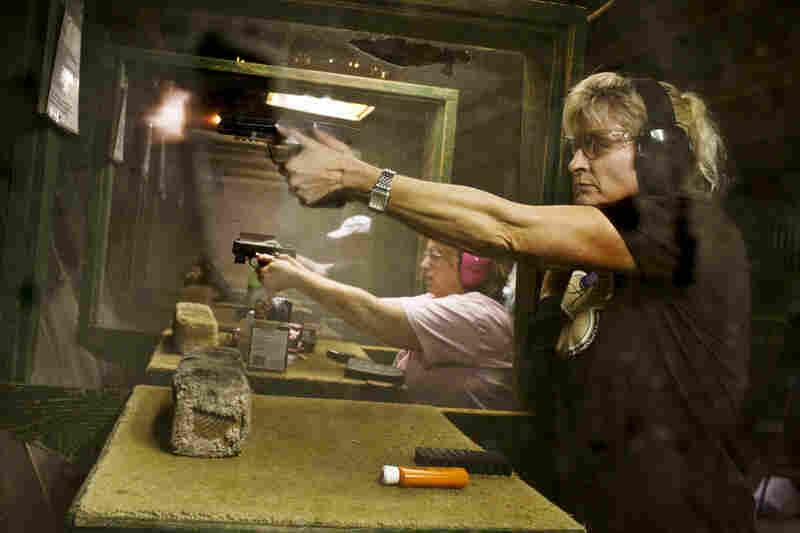 Are shooting ranges the new bowling alleys in America? 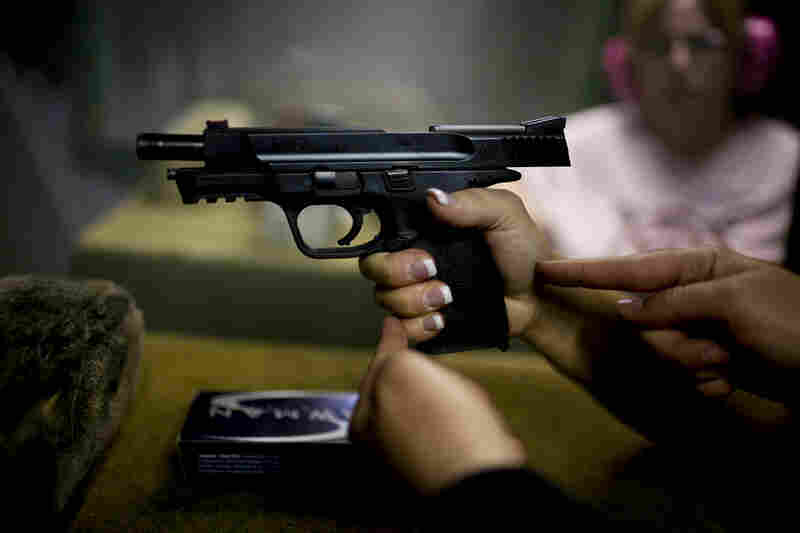 "Great description," says Julianna Crowder, a firearms instructor in Cedar Park, Texas. "Several ranges are starting their own leagues, hosting practice nights, and with that comes structure. Gun owners are not only practicing a skill set, they are improving that skill set with set goals and a purpose." 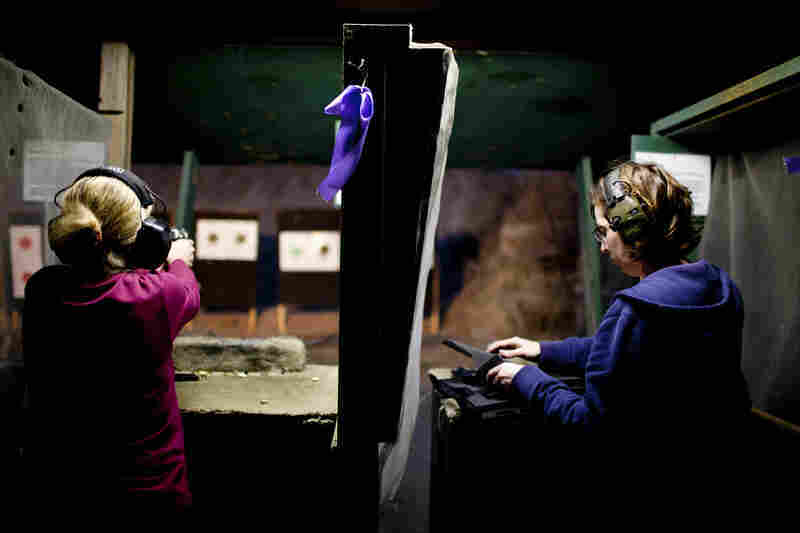 In the Washington, D.C., area, a group of women known as the Shooting Divas go to the range to shoot together. According to the website, the women sometimes try to gather for dinner beforehand, and child care is available on request. Contemporary America is torn apart by guns. Following recent, high-profile, multiple-shooting tragedies, politicians and pundits and the populace in general are in deep disagreement over citizens' rights and responsibilities when it comes to the bearing of arms. President Obama is using executive orders to tighten restrictions on ownership. Meanwhile, gun shows, gun stores and gun ranges are in the news. In southern Nevada, a half-dozen or so new shooting ranges have opened in the past few months, reports Vegas Inc., a website that tracks Las Vegas-area business. "Owners [are] trying to capitalize on the valley's booming gun industry," according to the website. In Las Vegas: The Gun Store has added a wedding chapel; Guns and Ammo Garage hosts bachelor and bachelorette parties; and, according to Vegas Inc., customers at Machine Guns Vegas "are offered free bottled water and energy drinks. Scantily clad hostesses fitted with holsters chat with guests." Special theme packages allow visitors to pretend they are in World War II or in a video game. There are targets picturing Osama bin Laden. In Murrieta, Calif., range master Seneca Garcia told the San Diego Union-Tribune in early January that "business is booming." Sure enough, the National Shooting Sports Foundation — organized in 1961 — counts as its members more than 6,000 firearms manufacturers, distributors, store owners, shooting range owners, sportsmen's groups and gun-related content publishers. 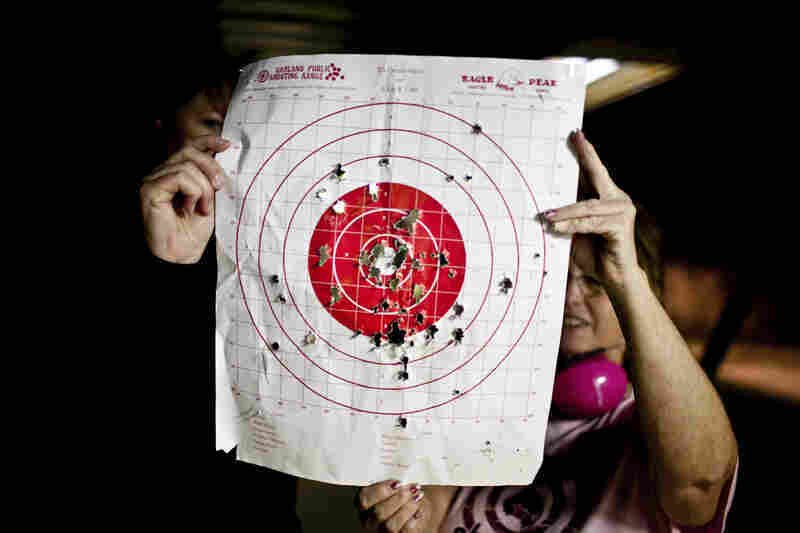 On its website, it will point you to hundreds and hundreds of shooting ranges in the United States, including more than 1,800 that have special programs for women and young people. 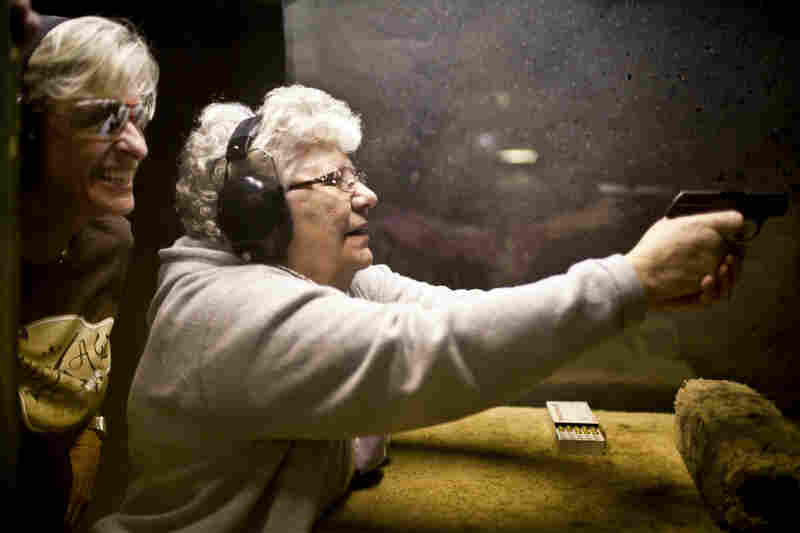 Here and there, communities are objecting to shooting ranges. But according to a 2011 survey by the shooting sports group, 93 percent of the American adults interviewed by phone found target shooting to be an acceptable practice. 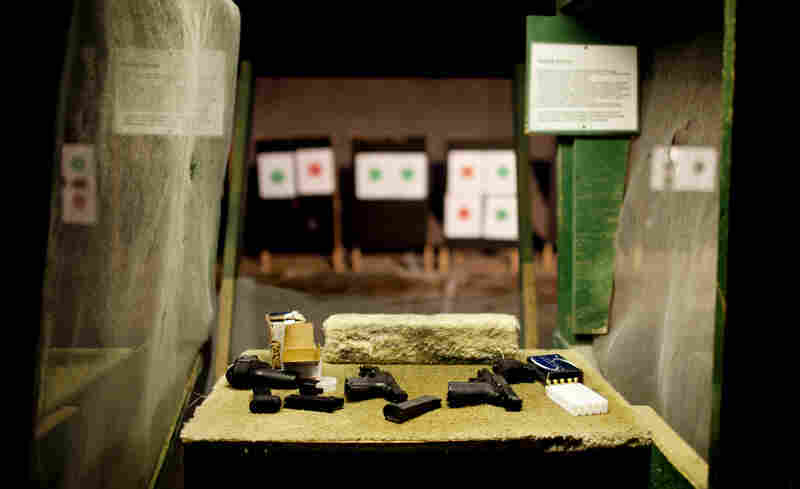 "I primarily go to shooting ranges with co-workers and friends, but occasionally with family as well," says Jonna Thomas, 30, who works in food research and development in Hollister, Calif. "Our favorite shooting range to go to is at Laguna Seca Raceway, because they have both a pistol and rifle range, and it is a central location for all of our group." The public range is run by Monterey County Parks and is open four days a week. Shooting range instructor Julianna Crowder (second from right) has dinner with fellow members of the shooting league A Girl and A Gun, in Leander, Texas. Each of her friends has a favorite type of gun, Thomas says. Hers is a .357 Magnum. "I enjoy improving my accuracy with that gun and learning how to handle the other types of guns," she says. She also says she doesn't plan to use the gun "in reality," but she enjoys the "high level of hand-eye coordination" that it takes to shoot well. Usually the group goes out for a few hours in the late morning. They compare scores and swap guns with one another. "We have one co-worker who is a true collector," Thomas says. While some fire off a few rounds, others hang out and chat together at picnic tables in the sun, Thomas says. "We go out to pizza for lunch." There is, she stresses, "a constant awareness of gun safety while at the range" — so they do not mix shooting with eating and drinking. The outing "is a friendly competition at the range," she says, "and binds us closer together." To much public debate, the National Rifle Association recently sanctioned a shooting-game application called NRA: Practice Range for mobile devices that delivers a home version of the range experience. Originally geared toward children ages 4 and up, the game received so much criticism, the recommended minimum age was raised to 12, The Associated Press reported. In Texas, range instructor Crowder says that parents are asking her to teach their kids the difference between real guns and video game weapons. "I did a private lesson for a 9-year-old boy as his Christmas present," says Crowder. The kid loves to play war games, but "he had never shot a real gun before." Crowder says, "It was a wonderful opportunity as a reality check." As for those who participate in Crowder's A Girl and A Gun shooting clubs and her Women's Safety Academy — featuring "ladies-only instruction" — Crowder says that a majority "use this as their 'girl time' away from the daily grind, the house, job, husband and kids." She has suggested to local ranges that they add day care centers. 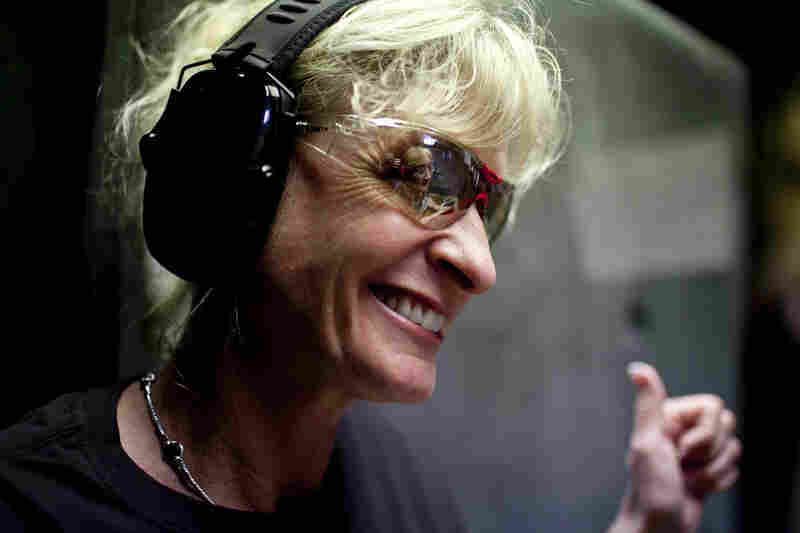 Some women's shooting groups hire certified babysitters, Crowder says. Others have volunteers who take turns watching the kids, "kind of like day care at church." To Josh Sugarmann, executive director of the Violence Policy Center, a Washington, D.C.-based organization focused on gun control, shooting ranges are dangerous — in more ways than one. Asked what he thinks about shooting ranges becoming the new bowling alleys in America, Sugarmann says, "Bowling alleys pose no lethal threat to participants; shooting ranges pose a risk to users." He cites VPC studies on the relationships between shooting ranges and suicide, other fatal gun incidents and lead contamination. "One of the most common e-mails we get at the VPC," Sugarmann says, "is from residents from across the country located near shooting ranges whose quality of life is affected by them: errant shots, lead poisoning threats and noise issues." Sergey Solyanik, owner of the Precise Shooter firearms store in Seattle, says that bowling alley-like practice ranges look more like "an attempt to consolidate the faithful" rather than draw new converts to shooting. "If the National Rifle Association really wanted to broaden the tent," Solyanik says, the group would have "toned down the rhetoric that repulses the increasingly liberal population. I am not seeing them doing this at all."